The TextureMedia team is just getting back from the first of three action packed days at the country's largest professional trade show: America's Beauty Show (ABS). This year, TextureMedia is hosting the first ever Texture Pavilion a dedicated stage and showcase area featuring six of the leading brands in texture including UseMe, Jessicurl, Jane Carter Solution, Hair Rules, Universal Beauty Products' My DNA, and Curly Hair Solutions. Each of these brands, and a few special guests including ARROJO and Avlon, will be hitting the main Texture Stage and doling out curl-centric education and styling tips. Dickey of Hair Rules kicking things off with a wavy-hair roller set and a finger styling and setting of smaller coils. Jess McGuinty of Jessicurl show attendees how to define and shape using her Rich Collection geared towards pumping up texture. 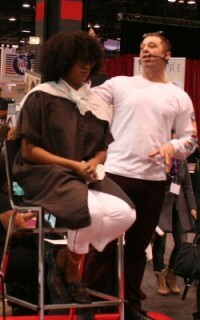 UseMe stylists using NaturallyCurly's own Michelle Breyer as a model and demonstration an finger spiraling technique to define and tighten her signature curls. Jonathan Torch of Curly Hair Solutions demonstrating how to use a simple nylon brush to SAFELY extend and stretch a tighter curl pattern. Stylists from Universal Beauty Products' My DNA showing of a suite of natural hair styles including comb coils, bantu knots, two-strand flat twists, and a fro-hawk. Outside of the Texture Pavilion, the show was in full swing with huge stage demonstrations from some of the biggest names in beauty. Here are our select snaps from the first day at the show! MyDNA models strike a fierce pose. 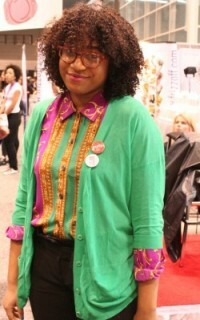 Fashion and art blogger Bianca deBardelaben of Avant Blargh doubles as a Hair Rules model. 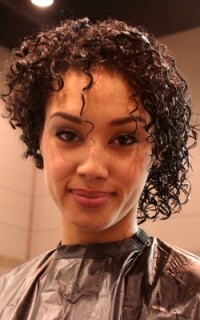 A Curly Hair Solutions model displays how to extend a curl with the use of a simple nylon brush. 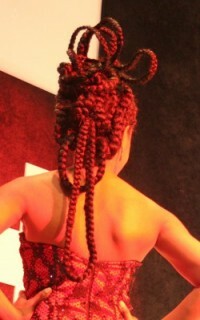 Haute braid style on the Chi stage. 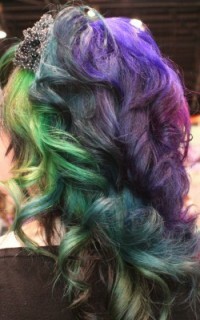 This man is selling candy-colored hair extensions. Clearly. Drama. Drama. Drama. 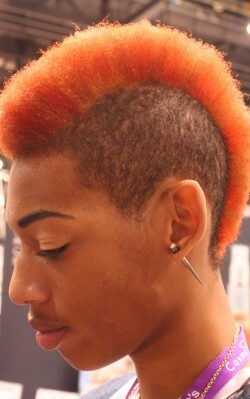 Love the orange hawk and ear spike! Tri-textured look on the Aquage stage. Nick Arrojo narrates a razor cutting technique. 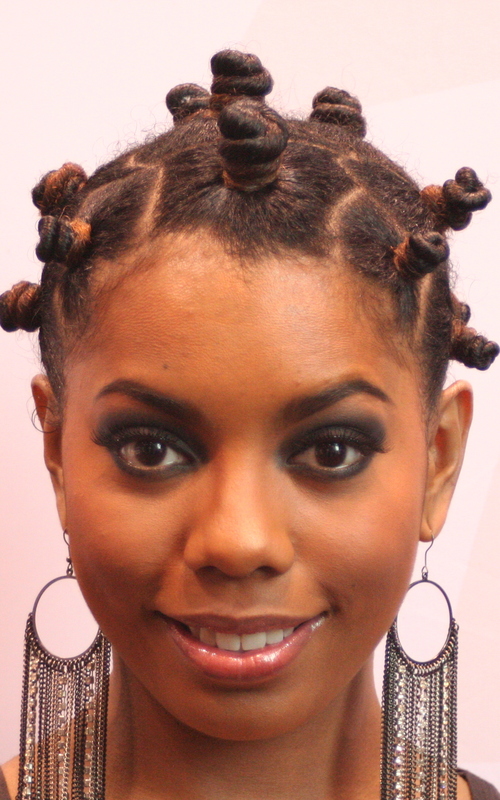 A MyDNA model shows off perfect bantu knots. Dickey of Hair Rules explaining how to work with 4a hair. 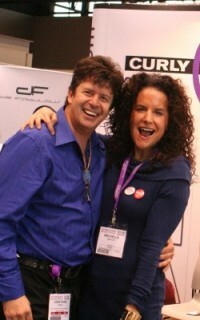 Jonathan Torch of Curly Hair Solutions and Michelle Breyer.